THE notorious intersection of Bishop Road and Great Northern Highway in Middle Swan is in line for a major upgrade starting in the 2016-17 financial year. City of Swan is finalising its plans for the works, which will include a dual lane roundabout at the intersection and upgrading Bishop Road to a dual carriageway between Great Northern Highway and Lloyd Street. Swan chief executive Jim Coten said a detailed cost estimate was not available yet, but design costs, utility relocations and the construction was expected to be around $2 million. “This large project is still at the design and planning stage,” he said. The current intersection layout requires southbound motorists to form one lane just before Bishop Road, where heavy traffic is waiting to turn right. There were 17 crashes at the site between January 2006 and December 2010. There are also congestion issues on Bishop Road, with some motorists reporting traffic jams stretching up to 800m along Bishop Road during peak periods. Mr Coten said the works would improve safety at the intersection and reduce congestion in the area. The intersection will fit into Main Roads’ ultimate plan to make the extended Lloyd Street a dual carriageway from Bishop Road to the Great Eastern Highway Bypass. 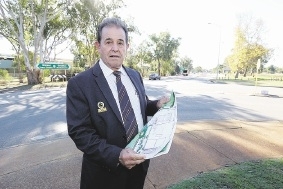 Swan expects increased traffic once the Lloyd Street upgrade is completed to a dual carriageway and extended to the Great Eastern Highway Bypass.